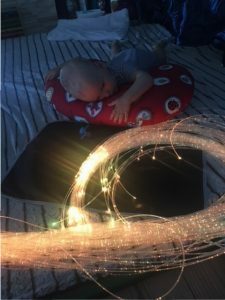 Jonas’ parents recently contacted our postal lending library to borrow some sensory lights. Mum Jolanta and dad Andrej told us their story. ”Jonas is a 2 year old boy who has CDKL5 disorder. 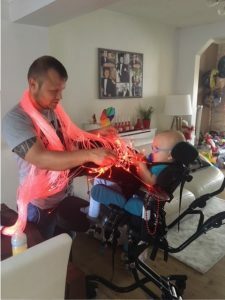 CDKL5 is a rare x- linked genetic disorder that results in early onset, difficult to control seizures, low muscle tone and severe neurodevelopmental impairment. Most children with CDKL5 do not walk, almost all do not talk and they have a range of other symptoms. Sadly Jonas has a cortical visual impairment (CVI) and can’t hold his head up yet. Unfortunately there is no treatment for his condition. 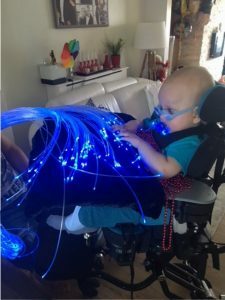 As a parents we are looking for all available options how we can help our son to enjoy life as much as possible. 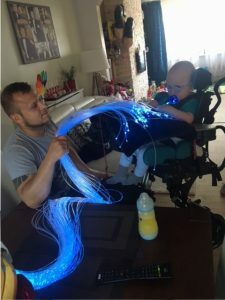 At the same time we want to improve his vision and that is a reason that we decided to try to borrow the fibre optics from Cerebra library. And it was amazing! 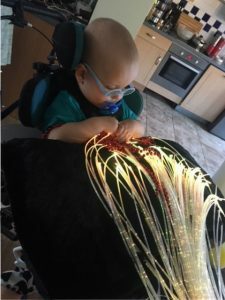 Jonas enjoyed fibre optics so much and it helped his therapy to stimulate his vision”. You can find out more information about our postal lending library on our website or by emailing [email protected].